Love Makes The World Go Awry - ZineWiki - the history and culture of zines, independent media and the small press. 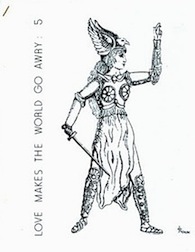 Love makes The World Go Awry was a science fiction fanzine by Fran Skene. Published in British Columbia, Canada, Love Makes The World Go Awry was a perzine, devoted to the editor's personal life, poetry, and a letter column. The first issue was released in December 1979. In 1980, issue 2 appeared in March; issue 3 in June; and issue 4 in September. Issue 5 came out in June 1981, and the last issue, issue 6, was published in August 1983. Fran Skene was also the editor of a number of issues of BCSFAzine during the periods June 1975 to January 1976, Oct 1977, and 1980. Skene was a contributor of the essay "Venus in Conjuction" to Pandora #3. In 1991, she was the editor of Fictions Free-For-All, an anthology published by the BCSFA which included her short story 'Susan, Shipped'. This page was last modified on 15 December 2017, at 20:39.